How's it going? August was exactly the chill month we needed after a pretty hectic summer. David and I celebrated 6 years happily married by going to the Ed Sheeran concert at the iconic Rose Bowl. We’re usually more intimate, sit-down venue kind of people (think drinking beer on a lawn or small, round table with an Old Fashioned) so it was fun but also slightly overwhelming to attend a production on that scale alongside 62,000 other concert goers. So yeah, I think we both agreed it fulfilled our one obligatory, quintessentially LA social experience for the year. Nothing like a special occasion to break out of daily routine and try something new. Here are the quieter scenes around these parts. Can you believe that we got through August without a single heatwave? For once, Fall actually felt like well, Fall. And if you’ve been following along on Instagram Stories, our watermelon patch continued to be a scene of much excitement. We began the month with three watermelon friends, but we sadly ended up losing one to a thieving critter. It was still fairly small and from past experience, the little, unripe ones seemed to go mostly unbothered since they weren't exactly sweet and tasty yet. Not this time. After discovering that it had been gnawed clean off the vine, I found its sad remains in the corner of the garden, completely hallowed out, surrounded by chewed up pieces of watermelon shell. It happened right under Hoku’s nose too! Sneaky little fellas. So out of six potential watermelons, we are now down to two, both protected by my makeshift cages. As we head into Fall, I'm fairly certain that our patch is nearing its final days. The leaves are not looking so hot. So all fingers and paws crossed that these two make it to the end so we can have a happy ending to this riveting watermelon saga. 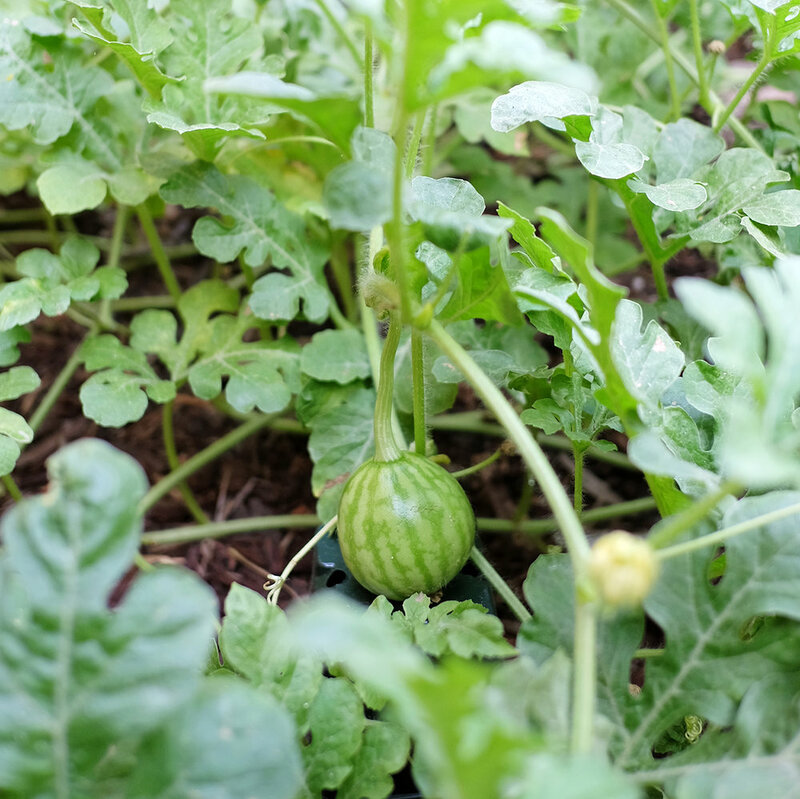 ↑ By the way, here are our very first melons from the patch that had cracked from the heatwaves that hit us in July. 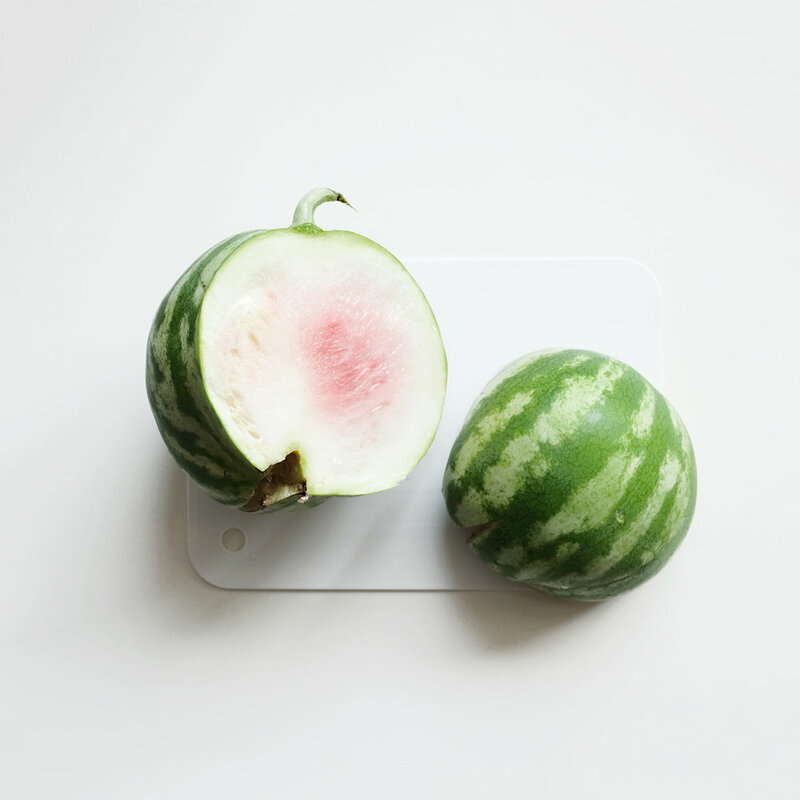 Just in case you’ve ever wondered what a little, unripe melon looked like on the inside. Basically, it is all rind. In the kitchen, we’ve officially rediscovered the joys of the Kitchenaid mixer. It was my mom’s and it had been boxed up in the garage for years because I was so worried about having to sacrifice more of the counter space we had available in our little kitchen. But let me tell you, my only regret is not taking it out sooner. Kneading bread and making fresh pasta has never been easier. No more sore arms for us. Our new favorite weekend lunch is a super simple pasta with freshly picked sun gold tomatoes and basil from the garden, with a touch of garlic, olive oil, salt and pepper. I also tried making pineapple buns (a childhood favorite) for the first time. I used my usual Hokkaido milk bread recipe for the bun and added the crust from this recipe here. So it’s a bit lighter than the traditional Tangzhong milk bread, which has a buttery dough, but it still tastes amazing and makes the entire house smell like a Hong Kong bakery. 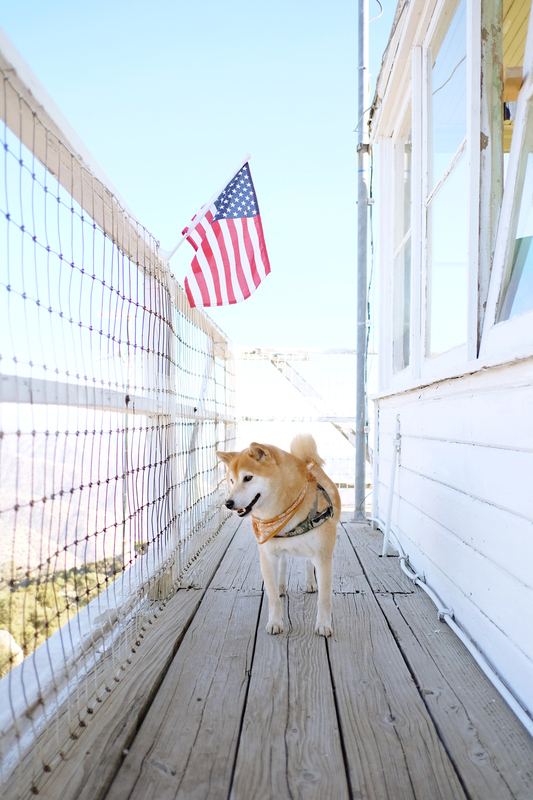 And of course, I can’t forget to mention our epic fire lookout adventure that kicked off August. 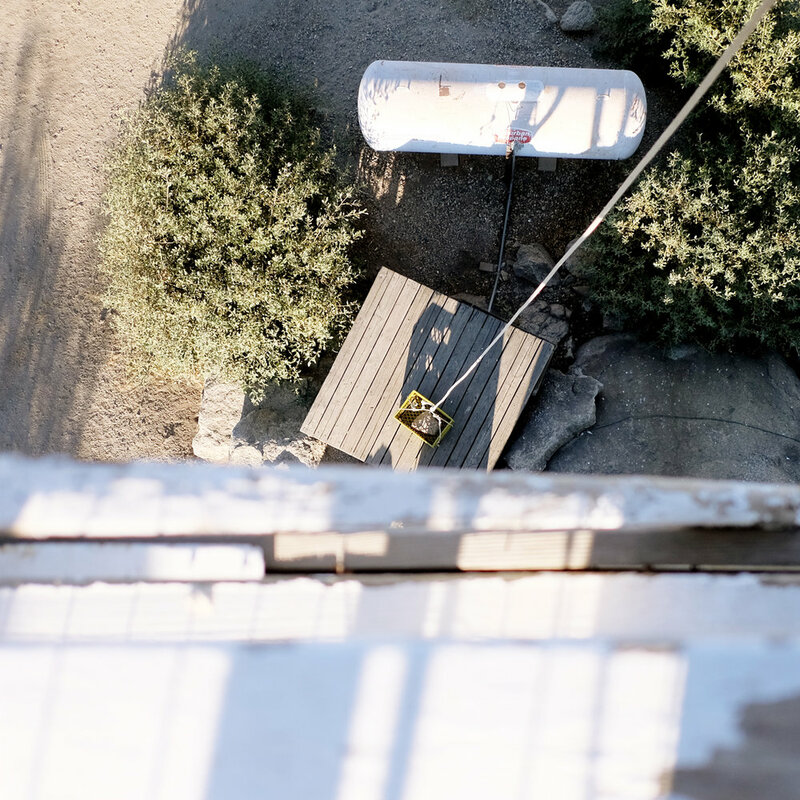 When Nacho’s parents invited us to join them for a weekend on a historic fire lookout in the Sequoia National Forest, one that they had booked 6 months in advance, the obvious answer was hell yeah. But as irony would have it, we indeed saw a wildfire from the lookout and had to make the difficult decision to evacuate only a few hours after arriving and setting up camp. The lookout was 45 minutes on off-road terrain from the main highway, which had the potential of being cut off by the fire and stranding us on the mountains. Not an ideal scenario to find oneself in during fire season when firefighting resources were already strained. We ended up making it back down the mountain just as the sky turned to black, which accentuated the eery faint glow of fiery orange in the distance. And that is how 4 humans and 2 pups ended up eating and laughing over fried chicken strips, tater tots and ice cream at a Sonic’s Drive-In at 10pm in the middle of who-knows-where in Bakersfield. Not the epic adventure planned but still good times with awesome company. 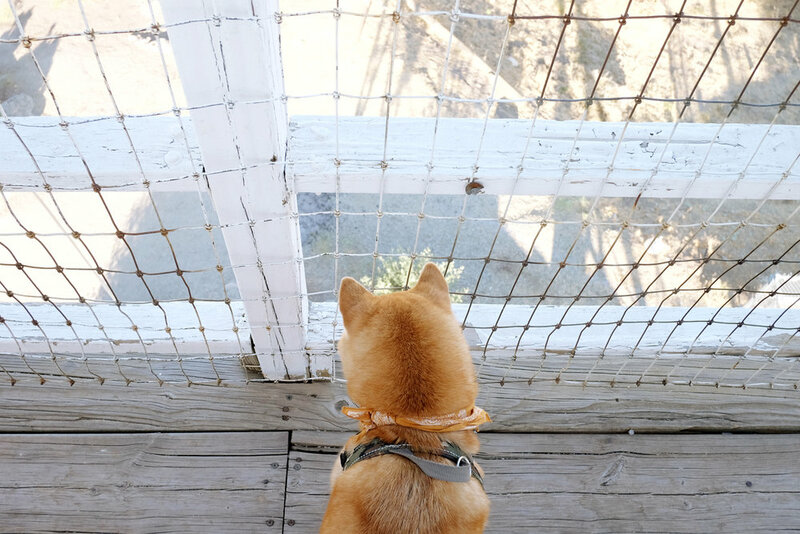 and boy meets shiba in Southern California. We love climbing mountains, weekend road trips, exploring our city, growing vegetables, and fixing up our little old house. We also appreciate a witty pun or portmanteau. Email Jen at hoku@hellojen.com for collaboration inquiries or visit hellojen.com for a personal portfolio of work and freelance design work inquiries. All content on this blog has been created by Hello Hoku, unless otherwise noted. To seek permission to share content, please contact Jen Ha at hoku@hellojen.com. All photos must be credited and linked to Hello Hoku. Some of the links contained in this blog are affiliate links. This means that if you click on and/or make a purchase from the affiliate through certain links on this blog or through any related social media platforms (including Instagram), I (Jen Ha) may receive a commission. Jen Ha (hellohoku.com) is a participant in the Amazon Services LLC Associates Program, an affiliate advertising program designed to provide a means for sites to earn advertising fees by advertising and linking to Amazon.com.